Welcome to my legislative website. It is an honor to have this opportunity to serve my community. Please do not hesitate to contact me with any comments, questions or concerns that you may have with the district—or with your state government. 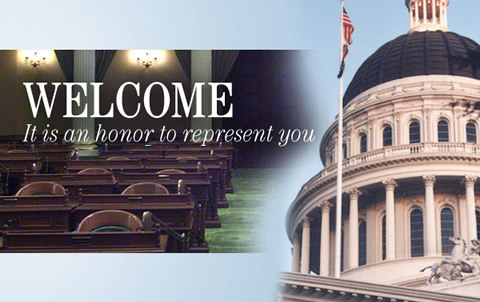 On Wednesday, April 24, 2019 - in recognition of Denim Day - Assemblymember Friedman joined her colleagues in signing a pledge to end the abuse and silencing of victims throughout our state. SACRAMENTO – Last week, Assemblymember Laura Friedman (D-Glendale) was recognized by the California Assisted Living Association (CALA) as their ‘Legislator of the Year’ for her work in improving the safety of California’s assisted living facilities through her bill AB 3098. BURBANK – At last night’s Burbank Unified School District meeting, Assemblymember Laura Friedman (D-Glendale) joined leaders from the Armenian National Committee Burbank Chapter in expressing support for Resolution 23, calling for April 24th, 2019 to be the official day of commemoration of the Armenian Genocide of 1915-1923. SACRAMENTO – This morning, an innovative measure by Assemblymember Laura Friedman (D-Glendale) creating the Office of Outdoor Recreation (OREC) to unite California’s vast outdoor recreation sector in order to promote education, health, and economic development passed its first committee. The bill, AB 1111, passed the Assembly Water, Parks, and Wildlife Committee with unanimous, bipartisan, support receiving 13 votes in favor and none opposed. On a Monday in February 2015, 13 year-old Rashawn Harris, known to his family as Ray Ray, told his father, Willis Harris, that he was on his way to school and that he loved him. He stepped out of the front door of his parents’ South Stockton home. There, as he waited in his own driveway for his ride to school, Ray Ray was gunned down. His father rushed out to find his son laying on the ground. Willis held his son in his arms as neighbors gathered along the street. It would be their last moment together as Rashawn Harris lost his life due to the .40 caliber bullets of a semiautomatic pistol. In the ensuing investigation, it was found that the murder weapon belonged to former Stockton Mayor Anthony Silva.